This is a summary of a research study conducted by ICORD Principal Investigators Dr. Victoria Claydon, Dr. Jamie Borisoff and colleagues. To read the original paper, please click here. Can the angle of your wheelchair affect your heart health? Have you ever wondered whether different body positions affect the way your heart pumps blood to the rest of your body? There are many kinds of wheelchairs on the market today. Some wheelchairs allow the user to change their seat position, giving them the freedom to adjust for social settings and physical barriers. However, the position of the wheelchair may also impact blood pressure, and how the heart pumps blood to the rest of the body. Your peripheral nervous system is the network of nerves that connect your brain and spinal cord (the central nervous system) to the rest of your body. Within your peripheral nervous system, there is a branch called the autonomic nervous system which is important in “automatically” controlling your vital organs and muscles such as your heart, digestive system, and lungs (without requiring your conscious involvement). You may have heard of the “fight or flight” response, and this is a good example of how your autonomic system can work. This response is activated by your sympathetic nerves (which make your heart race and pupils expand) and mitigated by the opposing parasympathetic nerves (which slow your heart and shrink your pupils). Depending on the location and severity of a spinal cord injury (SCI), the autonomic nerves controlling the heart rate and/or blood pressure may be impaired, causing “orthostatic hypotension.” This is a condition of low blood pressure that worsens when standing or sitting up, causing dizziness, tiredness, and possibly fainting. Damage to the autonomic nerves responsible for cardiovascular regulation is seen in individuals with injuries to the nerves in the upper part of the spinal cord (at or above the fifth thoracic level). How does the angle of your wheelchair affect your heart health? 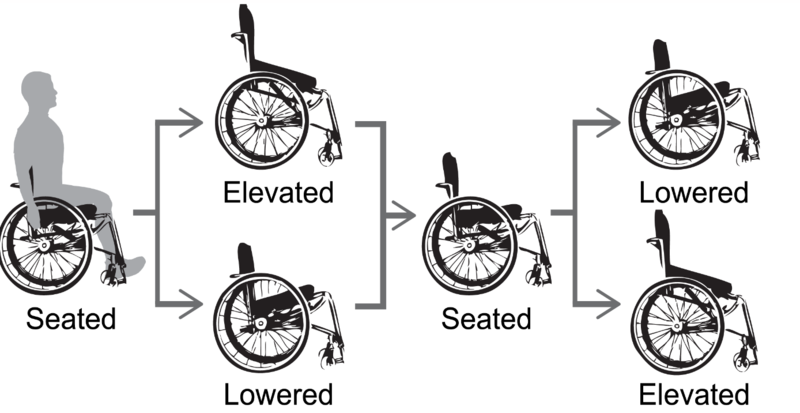 Researchers in this study tested their hypothesis that elevated seating positions can worsen low blood pressure in individuals with damage to the autonomic nervous system, and conversely, that lower seating positions can help improve conditions of low blood pressure. The experimental protocol used in this study. Image taken from original paper. The results of this study supported the researchers’ hypothesis. When compared to individuals with SCI that did not damage the autonomic system, and individuals without SCI, those with SCI damaging the autonomic system had lower blood pressures while lying down and sitting in a wheelchair with a horizontal seating position. When the seat was elevated in the experiment, the blood pressures of these individuals were further lowered, increasing the risks of low blood flow to the brain, and fainting. However, lowering their seats improved their blood pressures. These results caution people to be mindful when choosing new wheelchairs. 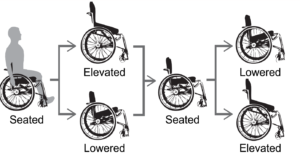 While wheelchairs with modifiable seating positions have numerous benefits, individuals with injuries affecting the regulation of their heart and blood pressure should be educated about the risks of low blood pressure, particularly when using elevated seating positions, and be aware of how to manage episodes of low blood pressure. Individuals with SCI, physiatrists and occupational therapists should discuss these issues when considering seating options to ensure they choose the best option for someone’s specific needs. What are some of the limitations of this study? One limitation of this study is the small number of participants, which may mean the group is not completely representative of the larger SCI community. Further studies should investigate the effects of seating positions during exercise (e.g. wheeling) and the effects of wheelchairs that allow standing, as well as the recently FDA-approved exoskeletons.